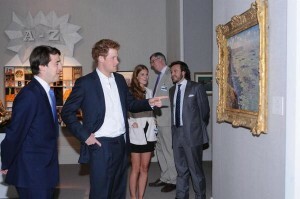 The Masterpiece, held in the grounds of the Royal Hospital, Chelsea, from June 29 through July 5, has just successfully ran for it’s second year and met with enormous success. Featuring more than 160 dealerships in a temporary structure at the Royal Hospital, the evnt has attracted the likes of Prince Harry, Oprah Winfrey, Elton John and Uma Thurman. The event, modeled on the European Fine Art Fair in Maastricht, aims to attract and appeal to London’s international residents and summer visitors, looking to invest in invaluable works of art. With Ruinart champagne and Vacheron Constantin, it is very much a social event too. Rolls-Royce Motor Cars Ltd. found an international London- based buyer — subject to the signing of the contract — for a Phantom Drophead Coupe. The car, priced at 400,000 pounds, included an Asprey jewelry box in the glove compartment. Among other sales, a Freud portrait priced at £850,000 and a 1960s Anthony Caro metal floor sculpture (over £200,000) both slipped from dealers’ hands into personal collections. There were no reported takers for a two-seater World War II Spitfire, which had a guide price of 8 million pounds. Exhibitors at the fair featured the likes of A la Vieille Russie, Butchoff Antiques, Didier Ltd., Jaguar Cars, JAR, Lefevre Fine Art, Carlo Orsi, Wartski and Marchant. Last revised by: admin, our reviewer, on September 17, 2012. I went to this ( didn’t manage to see Prince Harry sadly!) but it was a great experience. A lot of art on show – and some from the ‘great masters’ of old which was a nice surprise. Look forward to next year.